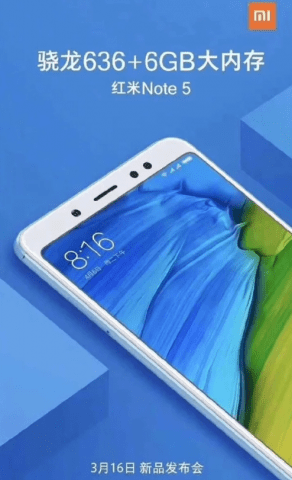 Xiaomi CEO Lei Jun published a teaser dedicated to the release of the smartphone Xiaomi Redmi Note 5 on the Chinese market. Since Redmi Note 5 is a complete copy of Redmi 5 Plus, the Chinese version of Redmi Note 5 will receive improved features. Xiaomi Redmi Note 5 for the Chinese market will be based on the Indian version of Redmi Note 5 Pro. He will receive an eight-core Snapdragon 636 processor with a maximum clock speed of 1.8 GHz and 6 GB of RAM. The remaining features will include a 5.99-inch IPS display with a resolution of 2160×1080 (18: 9), a dual primary camera with 12 and 5 megapixels sensors, a 20-megapixel front camera, a 4,000 mAh battery and support for two SIM cards. Presentation of the Chinese version of Xiaomi Redmi Note 5 will be held on March 16.